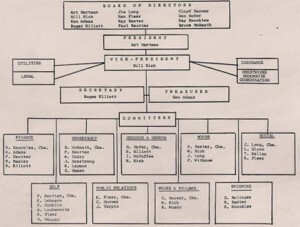 Organization of a private membership country club for the Bloomington-Normal area was undertaken in the summer of 1966 by a Twin City group led by Gilbert Deavers and Richard Barton. Letters were sent to more than 700 local families to survey potential support and the responses were very positive. Several possible sites were considered before the group settled on the current location just southeast of town. The hope was to interest a subdivider in locating a housing development around the golf course. The site was secured on a 147 acre tract owned by Harber Hall and Brookside Farms. Lawrence Packard of La Grange was hired as the architect and the golf course builder was the Wadsworth Company of Plainfield. Mr. Packard went on to design several courses in Illinois and all over the world. Wadsworth Company today is still the most widely used golf course construction company. The first 9 holes opened on June 1, 1969. 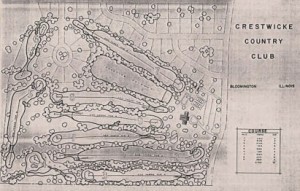 Watered fairways, big greens, and large bunkers were features far above those found on other area golf courses. The second nine holes opened for play in July, 1974. The second nine was not just added to the original nine. The plan was to build the front nine and intermingle the back nine when funds were available. The original 18 hole plan called for the nines to be reversed from how they are now played. Tom Guttschow was named the first pro-superintendent at Crestwicke in 1969. The upper level of the “contemporary rustic” clubhouse was completed in the fall of 1969. This floor contained the cocktail lounge, dining room, a multi-purpose room, and club office. The bottom level which contained the pro shop, bag storage, locker rooms, card room and 19th hole were finished in late 1971. The club secured a financial loan from Bloomington Federal in 1972 in the amount of $900,000 to purchase the 147 acres of land the club sits on from Brookside Farms. Shortly after this in December of 1974, Crestwicke faced foreclosure action. By February of 1975, Bloomington Federal purchased the club for a little over $1,000,000. Crestwicke enjoyed prosperity for several years after that. In 1992, Crestwicke was sold to a Japanese investor and managed by a group from Texas led by D.A. Weibring. They soon realized the difficulty in managing a private club from offsite and the current owners, Hurley Enterprises, purchased the club in 1996. The new owners soon put in over a million dollars in capital improvements. Today Crestwicke is a club filled with an active membership that enjoys the finest country club experience. Numerous renovations to the course, clubhouse, and grounds department have been made. Since its opening, the golf course has had nothing but rave reviews. Kept consistently in tournament condition, Crestwicke Country Club continues a tradition of excellence.